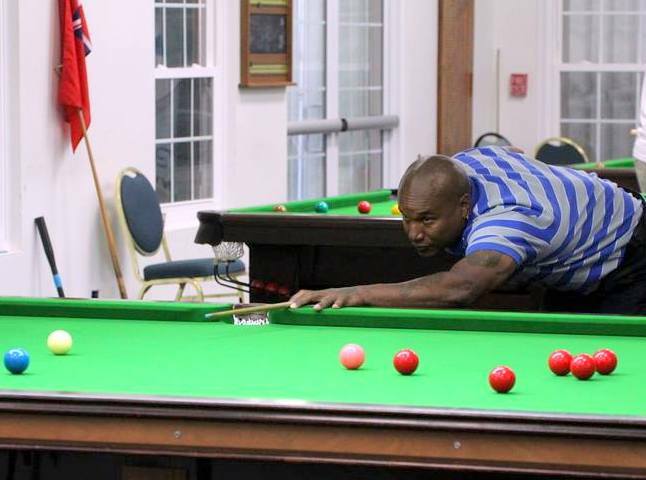 Three Bermuda Snooker Finals have been announced with all three taking place in the West End. Bermuda Open Singles Final is to be held at Watford Sports Club on Saturday April 27th at 6:00pm. Bermuda Open Doubles Final to be held at Watford Sports Club on Saturday May 4th at 5pm. Four more matches would take place in the Bermuda Snooker League season across the island. Watford Sports Club dominated Warwick Workmen’s Club Two at the Watford Sports Club resulting in a 5 – 0 win. Winslow Smith gave Watford Sports Club a 2 – 0 lead after he defeated Steven Bremar 58-30 & 66-42, the Watford Sports Club would go ahead 3 – 0 when Keino Zuill defeated Ray Desilva 54-25, Aaron Bean would make it 4 – 0 after defeating Zane Desilva by Default and in the Doubles Zuill and Bean won by default over Desilva and Desilva. RAA travelled west to the Sandys Boat Club and went down 5 – 0, Peter Bromby won the opener over Fred Richardson 40-19 & 56-29 to give Sandys Boat Club a 2 – 0 lead, Paul Fedden made it 3 – 0 when he defeated Kyle Williams 64-25, Martin Siese would extend the lead to 4 – 0 when he defeated Jelani Hollis 41-18 and the Doubles team of Fedden and Siese defeated Williams and Hollis 45-26. This win puts Sandys Boat Club One 2 points clear at the top of the table with one fixture left to play. Spanish Point Boat Club Two won the battle of the Spanish Point Boat Club teams when they edged the number One team 3 – 2. Scott Barnes gave Spanish Point Boat Club Two a 1 – 0 lead when he defeated Chris Dakin 50-31, the Spanish Point Boat Club Two would take a 2 – 1 lead after Billy Wotton and Todd Dziak split their game with Spanish Point Boat Club Two’s Wotton winning the first game 63-30 and Spanish Point Boat Club One’s Dziak won the second game 60-44. Spanish Point Boat Club Two would claim the victory when John Orr defeated Stewart Greenslade 81-34. Spanish Point Boat Club One would win the final game the Doubles to pull within one when Gumbs and Greenslade defeated Orr and Barnes 37-36. Warwick Workmen’s Club One would pick up a 4 – 1 win at home against Sandys Boat Club Two, Richard Burton would put the home team ahead when he defeated Tyler Siese 57-45, Gary Bascombe would extend the Warwick Workmen’s Club lead to 3 – 0 when he defeated Chris Bromby 55-39 & 76-13, Kidd Mouchette would make it 4 – 0 when he defeated Jim Mclenan 64-23. Sandys Boat Club would avoid being shutout when Siese and Mclenan won the Doubles over Mouchette and Burton 38-32. Sandys Boat Club One defeated Warwick Workmen’s Club Two 3 – 1 to win The Island Construction Services Cup at Spanish Point Boat Club. Mike Zimmerman gave Warwick Workman’s Club the lead when he defeated Sandys Boat Club’s Richie Beale on the Black Ball 39 – 28. Sandys Boat Club’s Peter Bromby then levelled the match at 1 – 1 after he defeated Warwick Workman’s Club's Ray Desilva 43 - 37. Paul Fedden gave Sandys Boat Club’s the lead when he defeated Warwick Workman’s Club's Zane Desilva 67 – 29. Martin Siese then clinched the title for Sandys Boat Club with a convincing win over recently crowned Desilva Cup Champion, Warwick Workman’s Club's Steven Bremar 77 - 26. 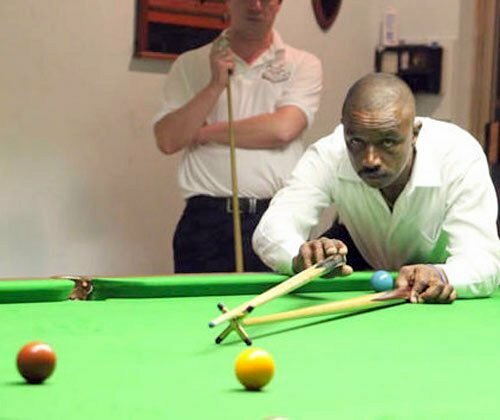 The Bermuda Snooker League season resumed with four more games on tap across the island. Sandys Boat Club traveled to the Spanish Point Boat Club and defeated the home team 3 – 2. Paul Fedden gave Sandys Boat Club a 2 – 0 lead when he defeated Scott Barnes 54-26 & 51-12, John Orr pulled a game back for the home team when he defeated Martin Siese 62-40, but Peter Bromby would earn the win for the Sandys Boat Club when he defeated Billy Wotton. The Spanish Point Boat Club would win the Doubles match as Wotton and Orr defeated Bromby and Siese 50-36. And the Zane Desilva and Bremar defeated Bascombe and Burton 57-42 in the Doubles. Todd Dziak gave Spanish Point Boat Club the lead when he defeated Jelani Hollis 60-1, Stewart Greenslade put Spanish Point Boat Club up 3 – 0 when he defeated Kyle Williams 52-38 & 47-27, Fred Richardson would get RAA on the board when he defeated Ed Gumbs 56-44. Spanish Point Boat Club would win the Doubles as Dziak and Gumbs defeated Washington and Richardson 75-17. Watford Sports Club would make the short trip to the Sandys Boat Club and defeated the host 5-0. Keino Zuill would put Watford Sports Club ahead when he defeated Chris Bromby 60-23, Winslow Smith would make it 3 – 0 when he defeated Jim Mclenan 50-2 & 43-4 and then Aaron Bean defeated Tyler Siese 64-19 to make it 4 – 0. Watford Sports Club would make it a clean sweep winning the Doubles as Zuill and Bean defeated Bromby and Siese 72-47. Warwick Workman’s Club’s Steven Bremar defeated Sandys Boat Club’s Peter Bromby 4-2 to win the Tony Desilva Memorial Trophy at the Watford Sports Club. Bremar would jump out to a 2 – 0 lead after winning the First match 56 – 23 and then he won the Second match 66 – 24. Bromby would pull a game back winning the Third game 53 – 41, but Bremar would restore his two game lead winning the Fourth match 46 – 27. In the closes finish of the match Bromby would win the Fifth match with a Black Ball finish 46 – 45, but Bremar would close out the match winning the Sixth match 55 – 27. It was an emotional night for the Desilva family as they presented the Tony Desilva Memorial Trophy to its first ever winner Bremar.